Despite numerous geopolitical threats (Eurozone elections, tensions between the US and China, North Korea, etc. ), worries about the demise of the so-called “Trump trade” and shares being overbought and due for a correction at the start of the year, share markets have proved to be remarkably resilient with only a minor pull back into their recent lows. This despite a more significant fall back in bond yields. Partly this is because the geopolitical threats have not proven to be major problems (at least so far) and Trump remains focussed on his pro-business policy agenda (he has already embarked on deregulation and his tax reform proposals – while lacking in details – indicate that tax reform remains a key objective). 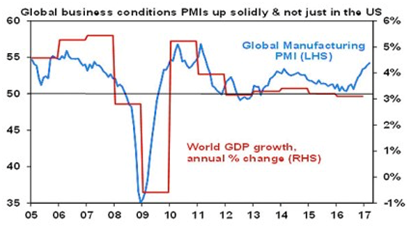 More fundamentally though, markets have been underpinned by an improvement in global growth. This is likely to continue. 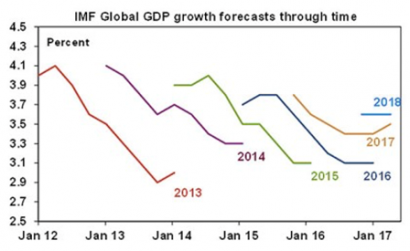 Numerous indicators point to a stronger global economy. 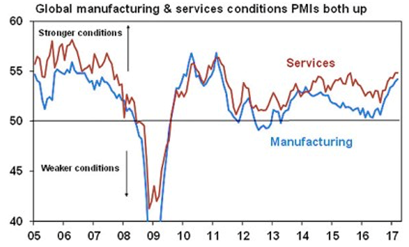 Business condition indicators – commonly called purchasing managers’ indexes or PMIs – have moved up to their highest since the post GFC bounce. 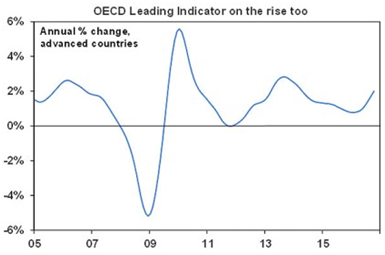 The OECD’s leading economic indicators (basically a combination of economic indicators that lead economic growth) have turned up decisively. Of course, there is one qualification to all these positive signs (there is always something!) and that is that the US economy looks to have seen a soft start to the year as measured by GDP growth. However, March quarters in the US seem to regularly come in on the soft side initially only to get revised up later and be followed by a bounce back in growth suggesting a seasonal adjustment problem. US unemployment claims running around their lowest since the early 1970s – no mean feat given that the US economy and population are much bigger today – tell us that the US economy remains strong despite a soft March quarter. 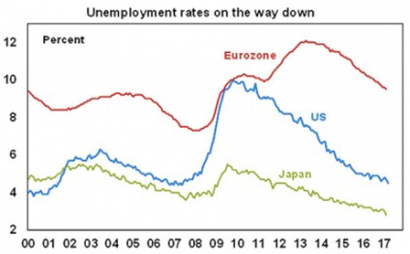 Years of ultra-easy monetary policy – zero and even negative rates and money printing – have finally got traction. Memories of the global financial crisis (GFC) and hence fears of another re-run are gradually receding – after all it is now 9-10 years ago (shares peaked in 2007!) – and so the negative impact on confidence is gradually receding too. Deleveraging (or the desire to reduce debt ratios) post the GFC – to the extent that it occurred – has arguably run its course. Ongoing support for share markets – as stronger growth underpins further gains in profits – which should mean reasonable returns from shares. Support for commodity prices – although it’s doubtful they will take off given the lagged impact of rising supply but it should mean we have seen the lows. A bottoming in the global interest rate cycle. The Fed will continue its gradual tightening in monetary policy in the US with two more rate hikes likely this year and a start to reversing quantitative easing later this year via a phased reduction in the Fed rolling over its bond holdings as they mature. 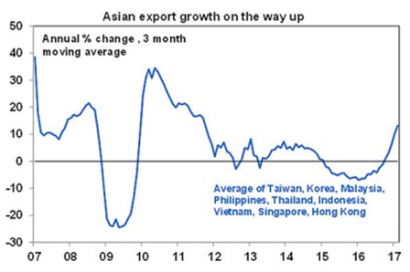 China is likely to continue tightening gradually as well. Other countries will eventually follow (albeit very slowly in Europe and then in Japan – but that could be years away). A resumption of the rising trend in government bond yields – after the pause seen since December – which is likely to mean low returns from government bonds. A rising trend in bond yields – albeit a gradual one – will weigh on bond proxies such as global real estate investment trusts and listed infrastructure assets constraining their returns relative to the double digit gains they have seen over the last five years in response to the prior plunge in bond yields.